Captain Phasma and Dengar battle Obi-Wan Kenobi and Ezra Bridger in the Jedi Temple on Coruscant. Jabba the Hutt and Jango Fett attack Rey and Finn as they pass through the frozen wastes of Starkiller Base. 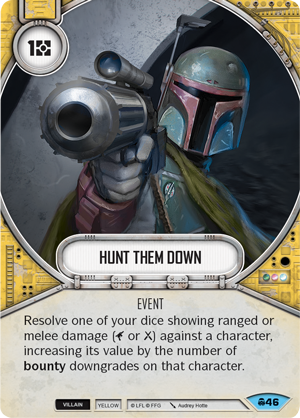 Play out your own epic, saga-spanning, “what if” battles in Star Wars™: Destiny, a collectible dice and card game for two players! 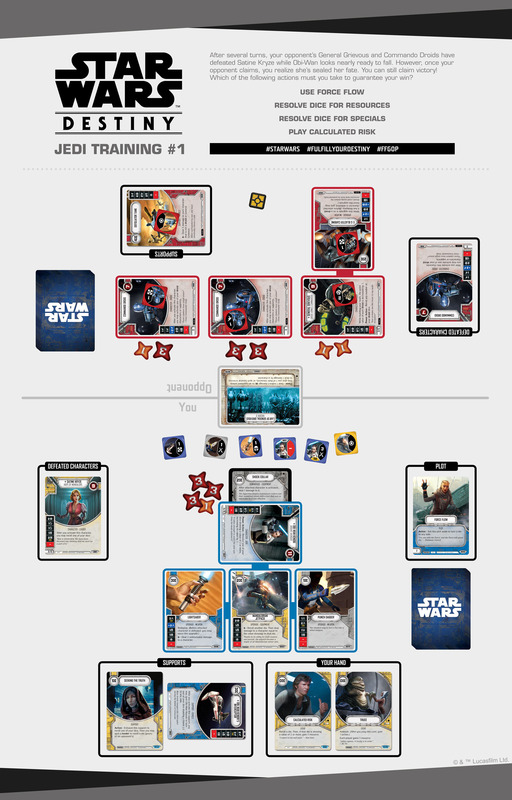 Star Wars: Destiny offers a tabletop experience that spans the entire saga—from Qui-Gon Jinn and Obi-Wan Kenobi landing on a Trade Federation starship to Poe and the Resistance escaping the clutches of the First Order on Crait. 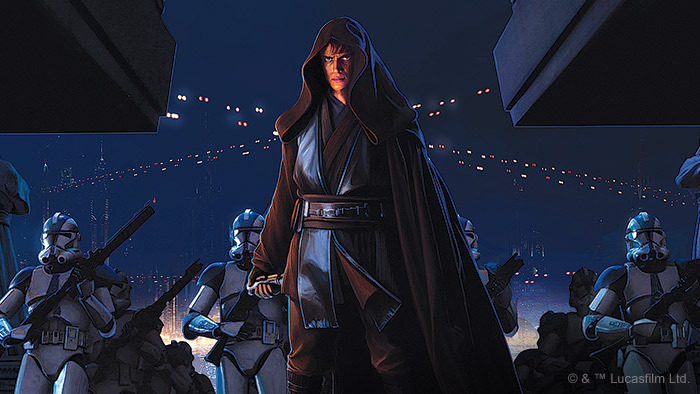 In every game, you’ll command a team of your favorite characters from across the Star Wars universe, using their unique skills and talents to defeat your opponent’s characters. 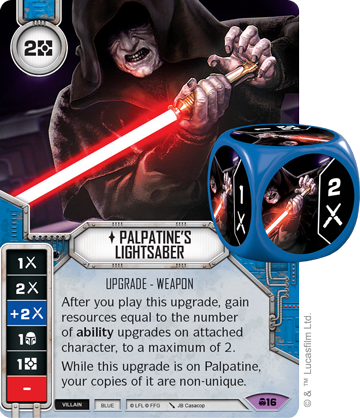 Each character in Star Wars: Destiny comes with a corresponding premium die. These large, full-color dice are different for each character, and by rolling the dice and spending their symbols, you’ll strengthen your forces and deal damage to your opponent’s characters. Each character’s health is shown in the card’s upper right-hand corner, and once you’ve dealt that much damage to a character, it’s defeated! 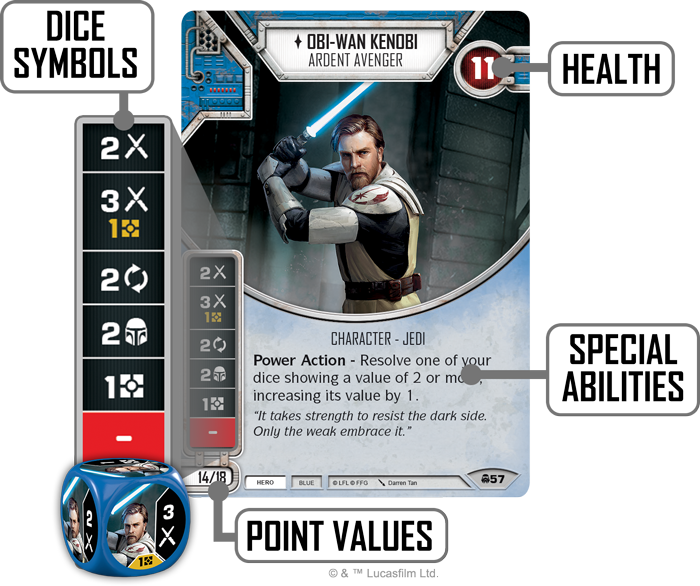 Each character card shows the character’s health, the symbols on its die, any special abilities, and its point values for constructing your team. Of course, the dice aren’t the only tool you have as you duel your opponent—you also have a thirty-card deck of cards that you’ll draw throughout the game. On your turn, you can take an action to play a card, paying the resources in the card’s upper left-hand corner as you can see below. The cards in your deck are divided into three major types: events, upgrades, and supports. Events offer an immediate effect when they’re played, and are then discarded. 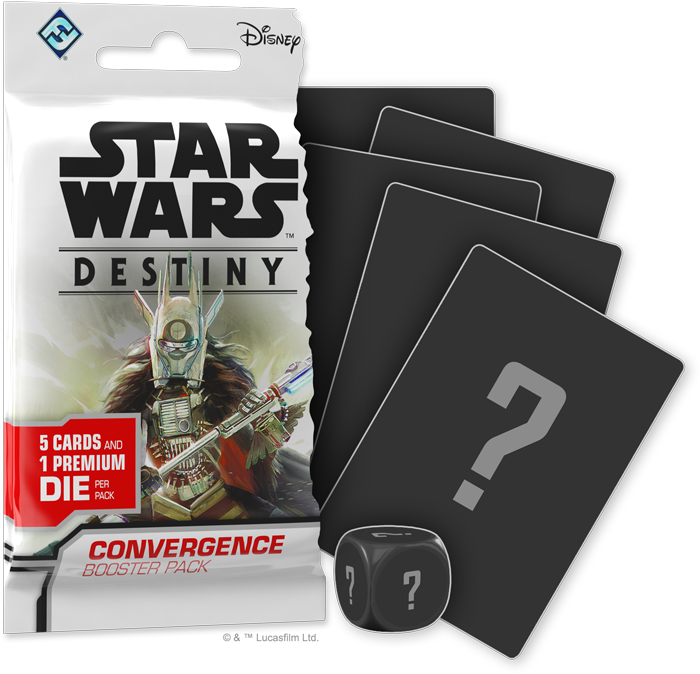 For instance, you may use an event to Hunt Down (Convergence, 46) your opponents and deal extra damage or remove your opponent’s dice with your Disciplined Mind (Convergence, 62). Upgrades like Palpatine's Lightsaber (Convergence, 16), on the other hand, attach to one of your characters, giving them dangerous new tools and skills. 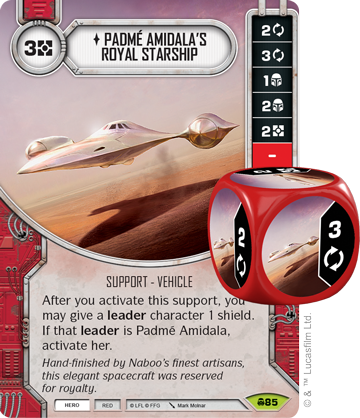 Support cards such as Padmè Amidala's Royal Starship (Convergence, 85) remain in play, independent of your characters but still contributing to your overall plan. 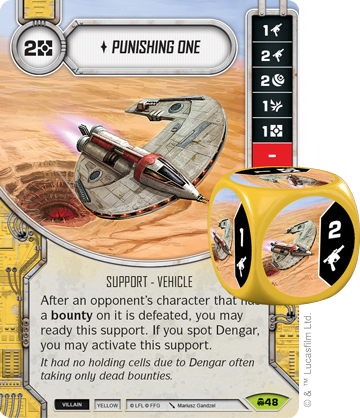 Many upgrade and support cards have their own dice associated with them. When you play these cards, you can bring the corresponding dice into play, giving you more dice and thus more options for outwitting your opponent! Finally, it’s important to know that the cards in your hand all have more than one use—as an action, you can discard a card from your hand to reroll any number of dice in your dice pool, giving you a better chance of getting the results you want. When you activate General Grievous, you roll the dice for Grievous and any attached upgrades like the Grievance Striker. These dice can be used on a later turn by spending an action. Indirect Damage – Spending this symbol deals indirect damage to your opponent's characters, distributed as they wish. You can take an action and spend Obi-Wan Kenobi's dice to deal melee damage to General Grievous! As an action on your turn, you may choose to claim the battlefield, taking the card and placing it in front of you. Claiming the battlefield guarantees that you will play first in the next round and lets you trigger the battlefield’s ability. 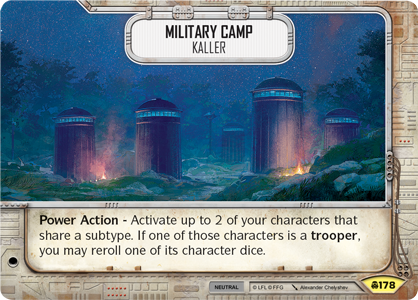 For instance, if you claim the Military Camp (Convergence, 178), you can use its Power Action to activate two of your characters at the same time as long as you control it! There is a downside to claiming the battlefield, however—as soon as you do so, you automatically pass all future actions, allowing your opponent to do as he or she pleases for the rest of the round. Every round, you’ll need to carefully weigh the future benefits of claiming the battlefield against your present need to take more actions. Claiming the battlefield gives you initiative for the next round, but forces you to pass all future actions for the remainder of the round. While Fantasy Flight Games has strong entries into every segment of the hobby marketplace—board games, card games, roleplaying games, and miniatures games—for the past nine years, we haven’t been part of the collectible game category. Many fans enjoy the aspects of discovery this format provides. 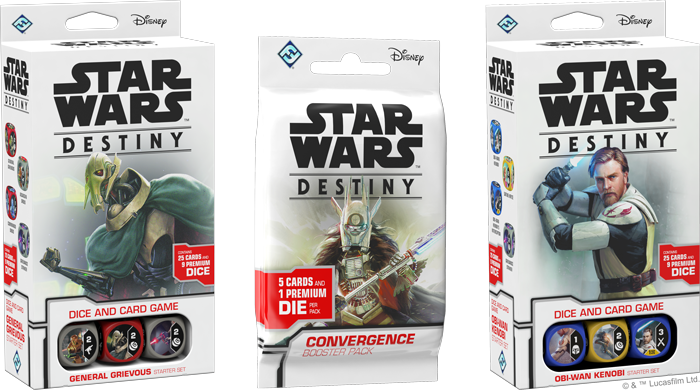 Star Wars: Destiny is a game that can only exist in this space, and we're excited to support fans of collectible games and we’re proud to reenter that space of the hobby gaming market. What does this mean for Living Card Games? 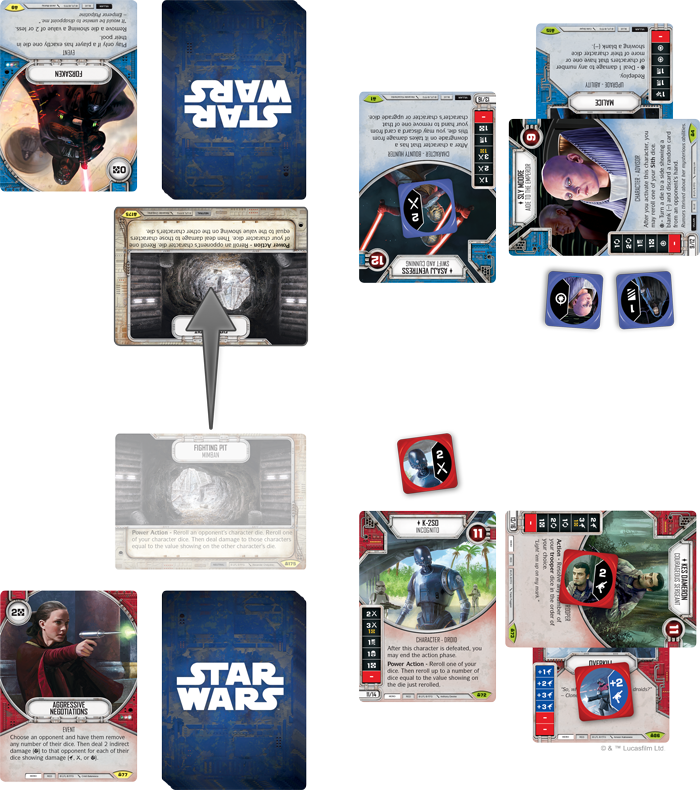 Star Wars: Destiny exists in a completely separate space from our Living Card Games®. Our LCG model has been extremely successful, and we are looking forward to continuing to support it, both now and in the future. We absolutely believe that collectible games and non-collectible games like LCGs can exist side-by-side, appealing to different segments of the greater gaming community. We want to offer strong options for fans of collectible games and fans of non-collectible games, while taking nothing away from either one. We look forward to supporting fans of both categories in years to come. What makes the dice different? 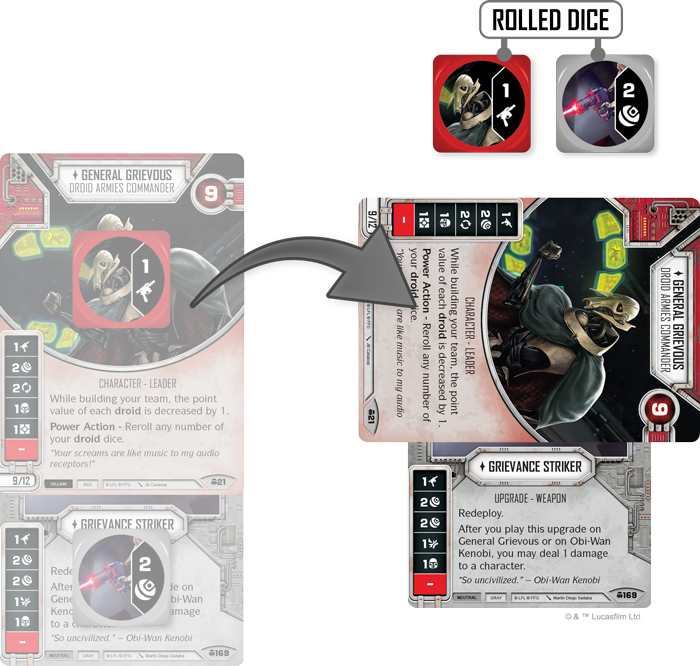 Unlike many games, the dice in Star Wars: Destiny do not use stickers. Instead, the dice are plastic-injected like normal dice and rolled in a tumbler to add a fine, smooth polish to every die. The images on each side are then physically heat-pressed onto the dice, essentially printing the artwork directly onto the plastic. Finally, the die is covered in a scratch-resistant coating, allowing you to roll these dice without their quality deteriorating. How will booster pack distribution and rarity work? 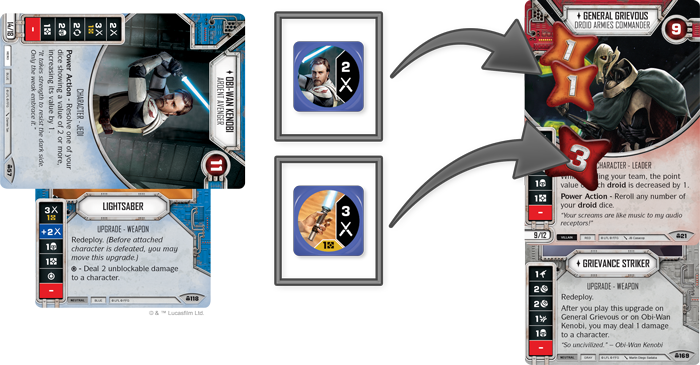 Your entry point to a game of Star Wars: Destiny is a starter set. These starter sets include a fixed set of cards with corresponding dice, plus tokens and a rulesheet, giving you everything you need for one player to start playing the game. 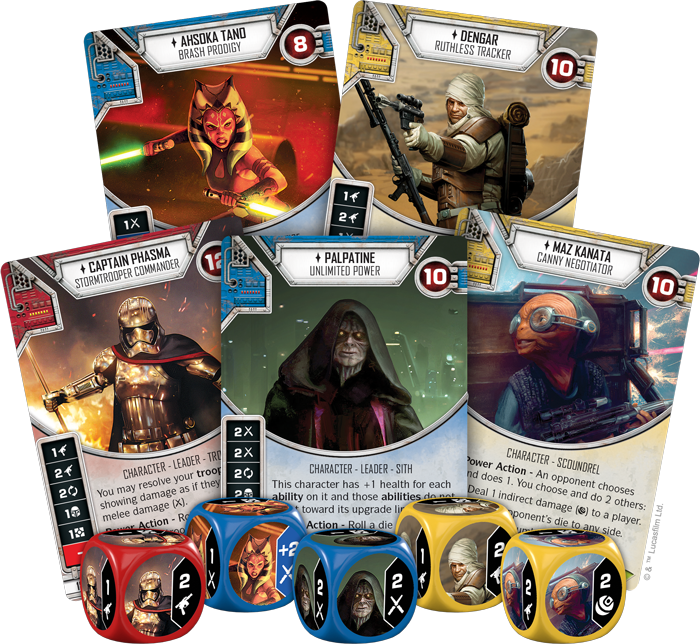 Booster packs for Star Wars: Destiny will include five randomized cards, one of which will feature a corresponding premium die included in the pack. In every booster pack, you will find three common cards, one uncommon card, and one rare or legendary card with a corresponding premium die. All cards that use a die are either rare or legendary cards. 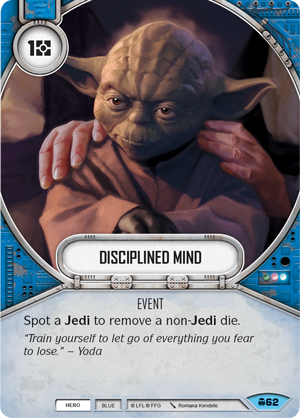 Star Wars: Destiny invites you to command a team of iconic heroes and villains from throughout the Star Wars saga and face your foes in a massive duel. 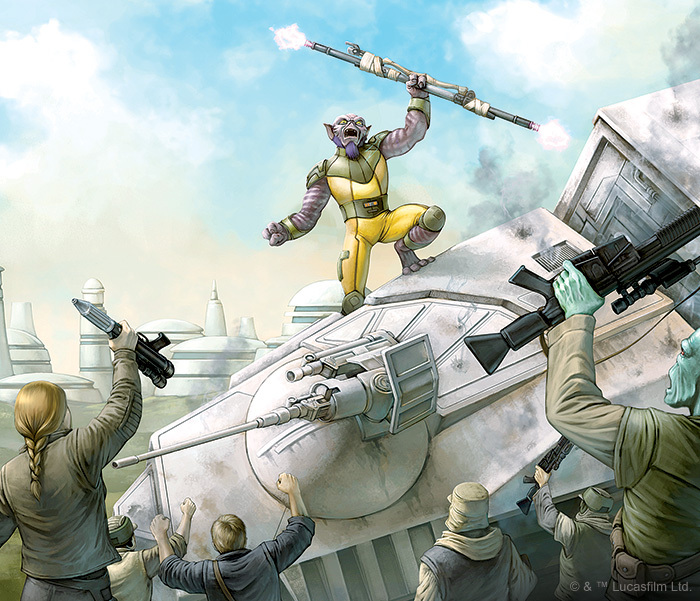 Whether you join the heroes or villains of the galaxy, the only limit to your battles is your imagination. 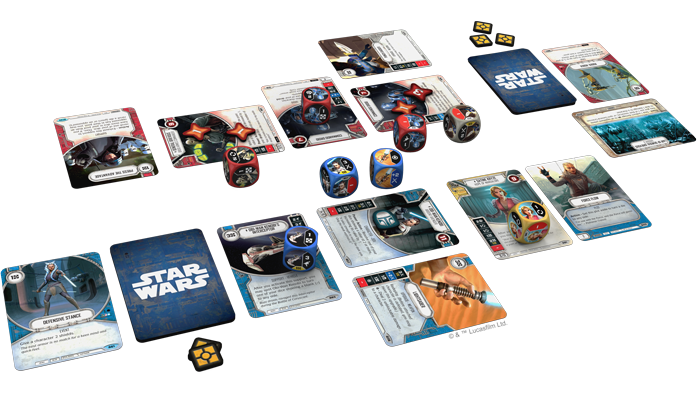 Tell your own Star Wars story with this collectible dice and card game! 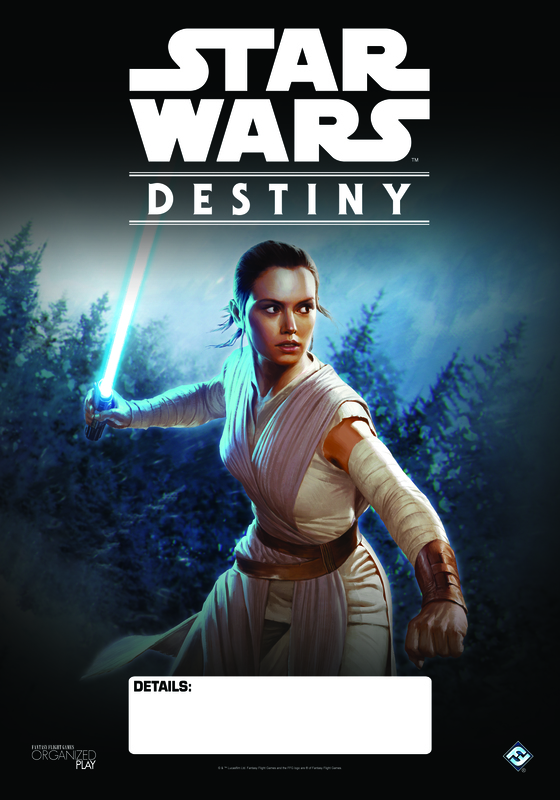 For Customer Service questions about Star Wars™: Destiny, visit: http://parts.asmodeena.com/about.php.